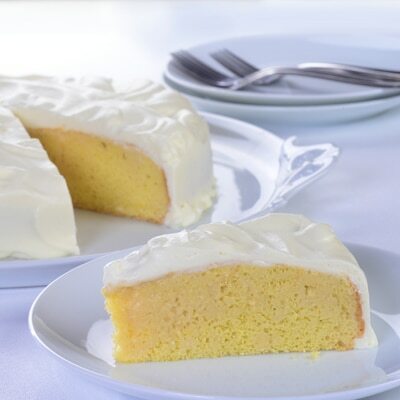 Savor this creamy Three Milk Cake - Pastel Tres Leches that will melt in your mouth. Three types of milk make this traditional cake of Latin origin an excellent way to impress your guests! BEAT egg whites and 1/4 cup sugar in large mixer bowl until stiff peaks form. Combine egg yolks and remaining sugar in large bowl; beat until light yellow in color. Fold egg white mixture and flour alternately into egg yolk mixture. Pour into prepared pan.